I bought a Wheaten female puppy (Bonnie) from you in 2007. I am considering getting a 2nd puppy this year, probably a black male. Bonnie is a holy terror sometimes but I love her dearly and have been very happy with her. 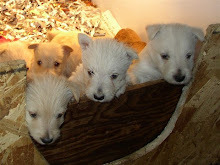 If I get a 2nd scottie my first perference is one of your puppies. Could you let me know if you think you will have one available spring or early summer.